Northwest National Real Estate: Sold! Clark Fork River Lots! Sold! 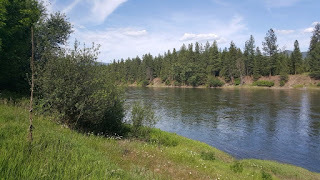 Clark Fork River Lots! Property includes two Clark Fork River lots in Western Montana right next to the boat access. Both lots include well, power, and septic and one lot has a small older cabin. The property is all level meadow with easy low bank access to river. Great fishing hole right out your front door. No covenants, allowing for RV parking or mobile. This area is 90% national forest lands which leaves plenty of room for wildlife, many ATV and hiking trails, hunting, and every kind of recreational opportunity your heart desires. Located just 5 minutes from the friendly community of St. Regis, Montana, this is a great time to purchase river frontage! Contact Spangler Real Estate for further information at (406) 649-0109. Priced at $145,000.